Merissa Campbell has always been something of a tangential player in the UK funky scene with which she is often associated. 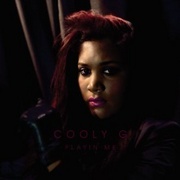 In interview, she seems to align herself more readily with the international deep house underground than with her London-based peers, and since signing to Hyperdub in 2009, Cooly releases have trod a fine line between soulful broken beat house-isms ('Love Dub', 'Up In My Head') and aggier bangers ('Narst', 'Phat Si'). In fact, it often feels like the dancefloor itself is only a secondary consideration for Campbell, a realm that's receptive to her ideas but that isn't necessarily their ultimate destination. So, while Campbell's distinctive, floor-ready hybrids are in ample evidence on her debut album, Playin' Me, maybe we shouldn't be surprised that they constitute the less interesting half of it. 'Landscapes' and 'It's Serious' will be familiar from last year's single, the former smooth, blissful, something of a statement of intent ("Leave your thoughts aside / Dive into my vibe"), the latter a slightly jarring combination of rugged breakbeats and silkily synthetic pads. 'Playin' Me' sits in intricately programmed percussive stasis for much of its length, before being swamped by a distended bassline of which label-mate and sometime collaborator Scratcha would be proud - a bold move, but one which gives the impression of imbalance rather than impact. 'What This World Needs To Know' is DMZ-ish halfstep transposed to 130bpm, a subtly funky head-nodder - and probably the best club tune here - but not enough to tip this record into the realms of brilliance. Ultimately, these tracks often end up feeling pale and slightly lacklustre: whether it's a matter of technical production chops or less tangible creative choices, they often lack punch and dynamic, a fact which is no doubt a turn-off for DJs in clubs as much as it is for yours truly at home. The excellence in Playin' Me, then - and there is excellence - lies elsewhere. Where many dance music producers struggle to justify their ventures into the album format (the number of truly successful LPs to come out of dubstep, for example, could probably be counted on one hand), Campbell has more than risen to the challenge, developing her own distinctive grammar that tips generous nods to the dancefloor whilse acknowledging that, in this new territory, fresh creative trajectories ought to be pursued. For a start, the fragments of vocal woven through past singles have been developed into a distinct lyrical style: direct, often overtly sexual, predatory almost, and showing a willingness to address the mundane tableaux of metropolitan romance (an exquisite example, from 'Good Times': "Dead streets / Me and my friends got a bite to eat / You were parked up by the bus stop / You and that smile that made me weep"). It's a seductive mix (lord knows we all want to be seduced - I know I do), and one that feels quintessentially 'of' London, showing how both the depth and the surface of romantic endeavour can be expressed without recourse to some placeless, faceless world of cliche and empty platitudes. These lyrics find a home in pop miniatures that are brittle, static (like the breakdown in a dancefloor record) but beautiful - swatches of twilit mood, or pools of synthetic lamplight in deserted midnight streets, if you're not averse to a bit of Burial-esque urban romanticism. When she's on point, Campbell's ear for a heart-hurting hook is impressive: 'Come Into My Room' is a lush Chicago house breakdown expanded and re-moulded into a proposition of disarming directness ("I wanna put you in the mood / You want me, I want you"); 'Trying' enacts a similar transformation on aquatic jungle, to similarly opulent effect; 'Good Times' is darker, more oppressive, but still essentially a blissful affair, all tightly compressed pads and wayward melisma before breaking into a compact rhythmic loop that you wish would go on for just 16, 32, 64 bars longer. Still, though, it feels like Cooly's pop project never quite achieves lift-off. Perhaps it's her unwillingness to stretch beyond a single idea, a single state in her songs - no bad thing in itself, but repeatedly it feels like brilliant ideas are being done an injustice, left to languish in stasis rather than elevated through development, expansion, contrast. Or perhaps it's Campbell's voice - it's by no means unpleasant or ineffective, but each time I listen to this record I find less to love in her pronouncements, find it harder to sink into the timeless ritual of following the grain, the expressive minutiae, the ineffable richness that animates the vocal chords of a great singer. Of course, you could you could argue that 'Pop Singer' is not the title Cooly G would give to herself, and that to judge this album on those terms misses the mark. But it feels like songs, pop songs, are fertile ground for Cooly - and, with a bit of graft and luck, something brilliant will come of it. Playin' Me is halfway there - or two thirds, maybe.